The Great Southern Stamp Sale: Late June, and I'm listing again! Folks, it's on again! I just got a free listings promotion from eBay, and that means I can happily list many items between now and 30 June. That means I'll be listing in all my spare time over those days. I don't have that much spare time, though - I have work and other commitments. Still, we should get through a LOT. I've already started with some alphabets, and (interestingly) clowns. The current few just happen to include my FAVOURITE alphabet set ever. I have my own copy, which is the only reason you get to see it. 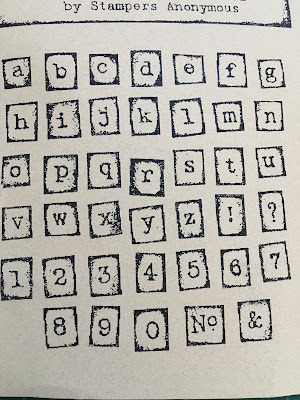 It's a Stampers Anonymous grungy alphabet, so cool! Why do I wait for free listings? It turns out that the listing fee in every transaction is pretty much the straw that breaks the camel's back. The whole process can be not worth it if I'm paying that too. There's plenty of other fees to pay (even a percentage of the postage, which I'm not crazy about). So I hope you'll bear with me.